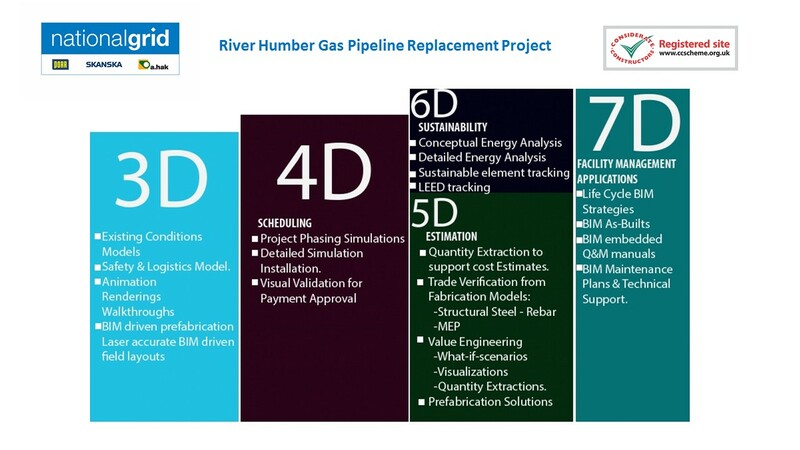 The River Humber Gas Pipeline Replacement Project has implemented Building Information Modelling (BIM) up to 7D which we believe is the 1st time a Civil Engineering Project has ever done so and this has allowed us to utilise this information for the purpose of Carbon reporting and capture. This will ensure that we obtain the most accurate Carbon Data recorded within the industry and we believe this is a method that will be adopted as best practice industry wide beyond our project. The information is reviewed by our Environmental team and is used to drive design changes which allow the project to implement methods that result in less of a carbon footprint. This information is recorded on the project’s internal system and is reported on a monthly basis to both the client and at a corporate level, identifying any changes that have been implemented. Often Carbon Reporting is not a full and complete picture due to the multitude of facets that are involved in a construction project however utilising BIM at 6D vastly improves the accuracy of the data captured. Avoidance of unnecessary waste helps to reduce carbon emissions, minimise waste going to landfill and demonstrates a commitment to sustainable construction. The efficient use of natural resources helps the industry to achieve cost and carbon targets, tackle the problem of rapidly diminishing resources and helps demonstrate that you are actively seeking new sustainable solutions.